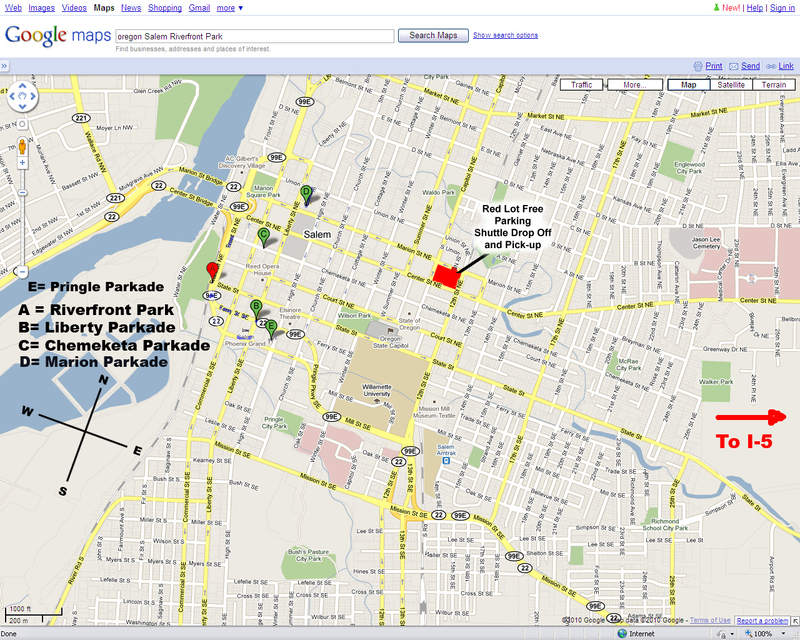 Click here for a large Google map with parkades listed. Free Park & Ride Shuttle service running every 20 minutes. Parking at State of Oregon Red Lot (get directions here). Pick up/drop off points at Marion & Capital (get directions here), and Court & Front (get directions here) across from the main festival entrance. Saturday at 9:45 a.m. 1st pick up at the Red lot, then every 15 mins. after — final festival pick up of the day will be at 11:07 p.m.
Sunday at 9:45 a.m. 1st pick up at the Red lot then, every 15 mins. after — final festival pick up of the day will be at 5:37 p.m. There is a supervised bike corral available on site to park your bikes. PARKADE & STREET PARKING: Free parking is available within a few blocks of Riverfront Park, either in parkades (parking garages), or on the street, although on Saturday parking may be difficult to find during the business day. On Sunday, many of the businesses are closed, therefore, more parking is available for Riverfront Park visitors.